The composite image at left, taken in visible and near-infrared light, reveals the location of five tiny galaxies clustered together 13.1 billion light-years away. The circles pinpoint the galaxies. Astronomers have discovered the most distant developing galaxy cluster known to date, shedding light on the formation of large-scale structure in the early universe, a new study reports. Researchers used NASA's Hubble Space Telescope to find five tiny but bright galaxies clustered together 13.1 billion light-years from Earth. That means Hubble is observing them as they existed just 600 million years after the Big Bang, the dramatic event that brought our universe into existence. "These galaxies formed during the earliest stages of galaxy assembly, when galaxies had just started to cluster together," Michele Trenti, of the University of Colorado at Boulder and the University of Cambridge in the United Kingdom, said in a statement. "The result confirms our theoretical understanding of the buildup of galaxy clusters. And, Hubble is just powerful enough to find the first examples of them at this distance." The study will also be published in an upcoming issue of The Astrophysical Journal. Hubble spotted the five galaxies while performing a random sky survey in near-infrared light. The newfound galaxies are small, ranging from 10 percent to 50 percent the size of our own Milky Way. But they're about as bright as the Milky Way, because they're feasting on huge amounts of gas via mergers with other galaxies, researchers said. Most galaxies reside in clusters or groups. Galaxy clusters are the largest structures in the universe, comprising hundreds or thousands of individual galaxies bound together by gravity. Hubble is seeing the five-galaxy protocluster as it existed 13.1 billion years ago; since then, it's probably grown to a size typical of its gigantic brethren, researchers said. Hubble's new discovery offers a rare chance to observe ancient protoclusters, which are dim and widely scattered across the sky. "We need to look in many different areas because the odds of finding something this rare are very small," said Trenti, who used Hubble's Wide Field Camera 3 (WFC3) to pinpoint the protocluster. "The search is hit and miss. Typically, a region has nothing, but if we hit the right spot, we can find multiple galaxies." 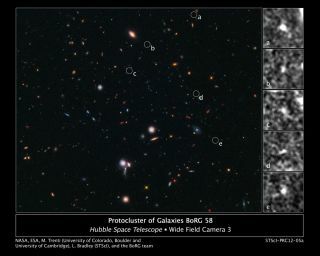 Compass and scale image of Borg 58 galaxy field. The new find helps demonstrate that galaxies build up progressively over time, researchers said. It also provides further evidence for the hierarchical model of galaxy assembly, which posits that small objects merge to form bigger ones in a steady process of collision and accretion. The fledgling cluster may consist of more than just the five bright galaxies Hubble spotted. The team suspects that many fainter galaxies may inhabit the same cosmic neighborhood, researchers said. The scientists estimated the distance to the newfound protocluster based on their colors, but they plan to follow up with spectroscopic observations, which measure the expansion of space. Those measurements will help pin down the cluster's precise distance, researchers said. Spectroscopic observations will also allow researchers to determine the galaxies' velocities, which should show whether they are gravitationally bound to each other.